So I recently decided to get a new desk and update my “desk setup”. 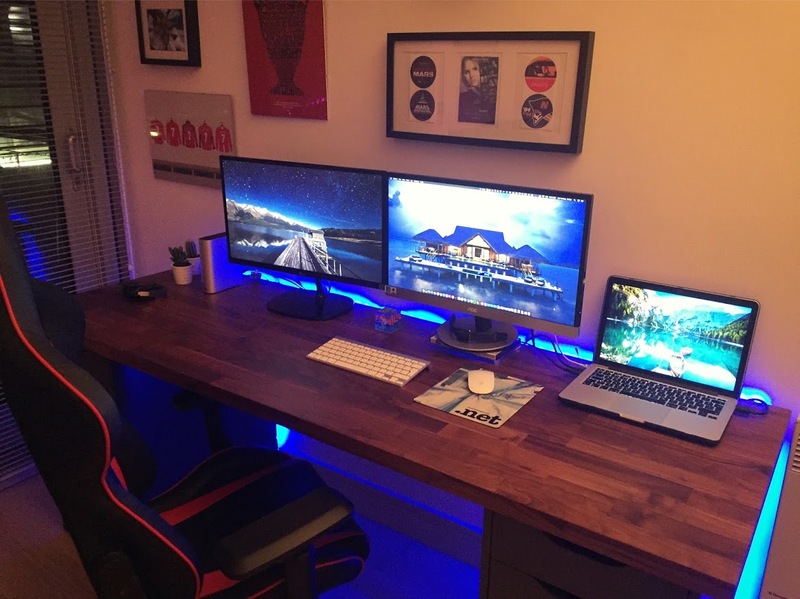 I had my previous desk for several years – basically since I started my business in 2008. It was a black desk from Ikea which was also had a box shelf (it was called an Expedit Desk I think). I was happy with it at the start but very soon realised that a black desk, which may look nice when clean, gathers dust so quick. And probably a black desk may be a bit “old” now? Also, since I didn’t use a mousepad from the start, the top “layer” rubbed away so that didn’t look good. 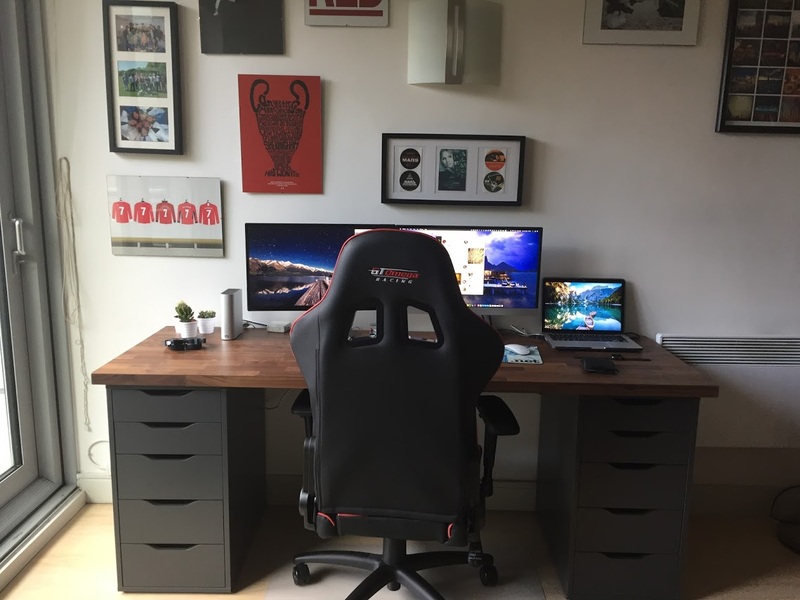 Now for my new desk, I had seen various videos and articles on people with new desks which actually were not desks but actually a kitchen worktop. I liked the look of them – pretty simple, big and also available in a nice dark wood colour – which matched other furniture. So after having a think about it and doing some measuring to make sure it would fit, I went to Ikea one day. I also bought a cable tidy and also couple drawers to use as legs. The worktop was a bit heavier than I thought would be. Knew the weight from the web site but combination of the size made it awkward. I just about fit it into my little car (Vauxhall Corsa)! Once it was in the car I was happy. Even though I live in apartment building and could have potentially been very hard to carry up – I went to Ikea on a weekday so was on my own – I got access to the car park in my building and I live close to the lift. The chair you can see in the photos is a GT Omega Racing office chair – which is on top of just a basic floor protector (otherwise my wooden floor would be destroyed). Also on my desk is a 3TB Western Digital external hard drive – just connected by USB – which I use for extra storage and TimeMachine backup and 2 monitors. One connected by HDMI and another by DVI. One is an AOC and other is a LG. Unfortunately they are different heights so using cable DVD cases to raise height of one. Maybe one day will wall mount them? Most of the pictures on the wall are Manchester United ones – prints from HannahCDesigns – Manchester Is Red, Juan Mata one, No 7 shirt and one to do with 1999 Champions League win. Also in the frame just above the monitors is some stickers I got when I supported the Veronica Mars movie Kickstarter. Also have some LED strips behind the desk – just some I bought from eBay which were £5-10 (something like that). There is sort of an empty space on the wall – unbalanced? Waiting for a suitable print…. ideas? Possibly something Manchester related? Worker bee? Also, I sort of want some speakers too but don’t really know if I “need” speakers. Mostly listen to podcasts while at my desk (while working) – but when not working, if e.g. watching YouTube videos, will sound better than just speakers from Macbook. (Although I don’t watch YouTube videos on my TV).